Based on a fundamental chemical discovery by scientists at Oregon State University, it appears that trees may soon play a major role in making high-tech energy storage devices. OSU chemists have found that cellulose – the most abundant organic polymer on Earth and a key component of trees – can be heated in a furnace in the presence of ammonia, and turned into the building blocks for supercapacitors. These supercapacitors are extraordinary, high-power energy devices with a wide range of industrial applications, in everything from electronics to automobiles and aviation. But widespread use of them has been held back primarily by cost and the difficulty of producing high-quality carbon electrodes. The new approach just discovered at Oregon State can produce nitrogen-doped, nanoporous carbon membranes – the electrodes of a supercapacitor – at low cost, quickly, in an environmentally benign process. The only byproduct is methane, which could be used immediately as a fuel or for other purposes. “The ease, speed and potential of this process is really exciting,” said Xiulei (David) Ji, an assistant professor of chemistry in the OSU College of Science, and lead author on a study announcing the discovery in Nano Letters, a journal of the American Chemical Society. The research was funded by OSU. These carbon membranes at the nano-scale are extraordinarily thin – a single gram of them can have a surface area of nearly 2,000 square meters. That’s part of what makes them useful in supercapacitors. And the new process used to do this is a single-step reaction that’s fast and inexpensive. It starts with something about as simple as a cellulose filter paper – conceptually similar to the disposable paper filter in a coffee maker. Supercapacitors can be used in computers and consumer electronics, such as the flash in a digital camera. They have applications in heavy industry, and are able to power anything from a crane to a forklift. A supercapacitor can capture energy that might otherwise be wasted, such as in braking operations. And their energy storage abilities may help “smooth out” the power flow from alternative energy systems, such as wind energy. They can power a defibrillator, open the emergency slides on an aircraft and greatly improve the efficiency of hybrid electric automobiles. 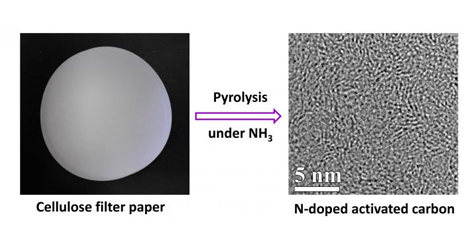 Besides supercapacitors, nanoporous carbon materials also have applications in adsorbing gas pollutants, environmental filters, water treatment and other uses.